Teranga Gold reports that ongoing drilling at depth and immediately to the north of its Sabodala open-pit gold mine in Senagal continues to confirm higher grades in a potentially expanded pit. Drill intercepts have included 85 m grading 3 g/mt gold and 99 m grading 1.3 g/mt gold. Exploration results during 2011 and early 2012 indicate that existing gold mineralization can be expanded by an additional 20 million to 30 million mt over the next 12 to 18 months at grades of between 1.5 and 2 g/mt, for a total inventory of 2.5 million to 3.5 million oz of gold on the Sabodala mine license. This would increase mine life to about 15 years at a gold production rate of about 200,000 oz/y and would provide a solid production base to support Teranga’s regional exploration program. Teranga has budgeted $20 million for drilling on the Sabodala mine license during 2012, with a minimum of 6 drill rigs testing new targets and converting existing resources to reserves. 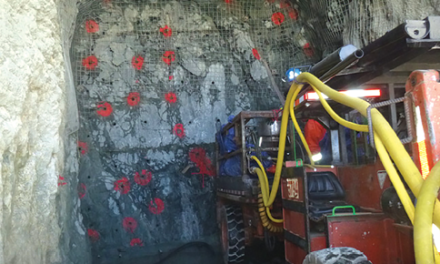 Drilling during the first and second quarters of 2012 has focused on in-filling and extending mineralization in the immediate vicinity of the current ultimate pit. Teranga expects Sabodala to produce between 210,000 and 225,000 oz of gold during 2012 at cash costs of $600 to $650/oz.